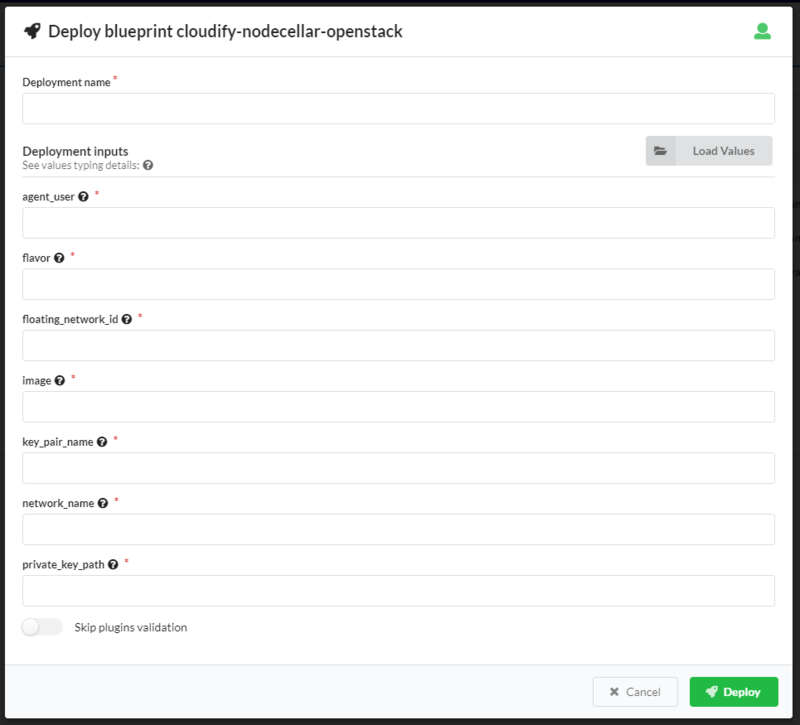 In order for Cloudify to deploy your application, it reads the uploaded blueprint YAML (the logical representation) and manifests a model called a deployment. A deployment is a “technical” drilled-down representation of your application. For example, if a blueprint describes a single server node that is defined to deploy multiple instances, the deployment will comprise the instances themselves, together with their unique identifiers. Creating a deployment does not actually create any resources, it simply generates a “physical” representation of your application from a “logical” (blueprint) representation and stores it in the database. Technically, it is a virtual environment on Cloudify Manager. On the Blueprints widget, select the required blueprint and click Deploy. After creating the deployment, you can open the Deployment widget to track the initialization stage. For information about deployment states, see the Deployments Page documentation. After initialization is complete, you can start using the deployment and executing workflows. This example shows how a deployment can be created for a blueprint, using the command line. For more information about creating deployments using the command line, click here. All inputs have default values so no input file is needed. The image is again the AMI image ID. The size is the instance_type, and the agent user is the default user agent on the image type. You have created a deployment named nodecellar, based on a blueprint of the same name. This deployment is not yet activated, because you have not yet executed an installation command. If you open the Deployments page in the Cloudify Console, you can see that all node instances are not yet initialized. After creating a deployment, you can execute it.